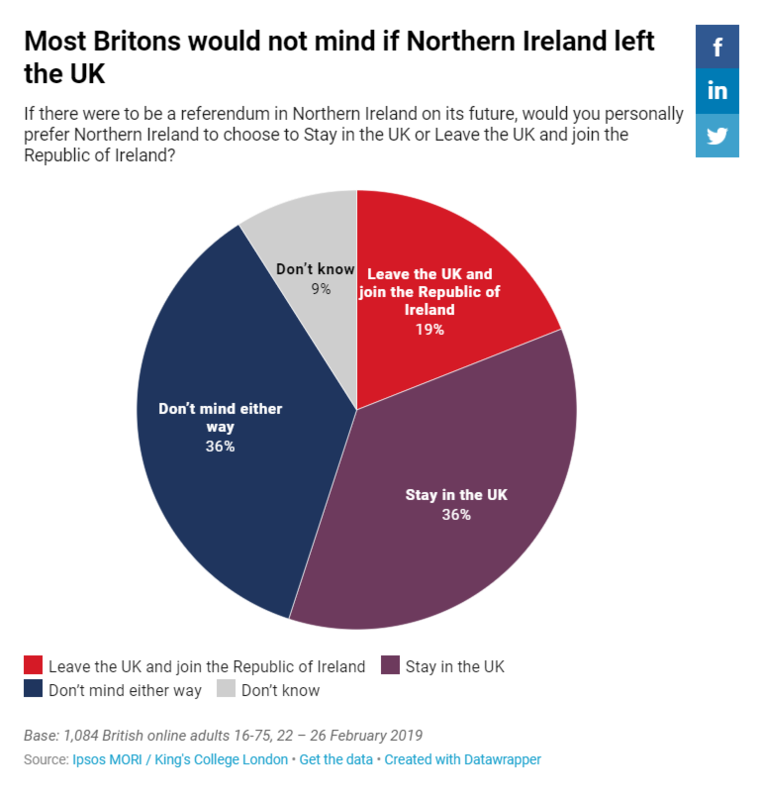 A majority of voters in the United Kingdom, some 55%, would prefer if “Northern Ireland” joined a reunited Ireland rather than stay in the UK or don’t care either way. That is the result of a new poll by Ipsos MORI in London, which also found that a minority of Britons, only 36%, would like the British legacy colony on the island of Ireland to remain under the authority of the UK. Those percentages are very similar to figures seen in a number of recent surveys in Britain, which highlight a domestic electorate increasingly disenchanted or disinterested in the country’s presence in the Six Counties, especially in light of the torturous Brexit negotiations between the United Kingdom on one side and the European Union and Ireland on the other. Negotiations which are consumed with debate about the current and future status of the contested region and the damage Brexit is causing to the Irish-British peace process. So much for the DUP’s fairweather friends. Those are interesting statistics. Not so ‘precious’ union after all where just about 1 in 3 want it to stay. Honestly this reads like an extreme case of “Quagmire Fatigue”. The amazing thing is that it’s taken this long to win out. 1) When the Troubles started in the 1970’s. 2) When The Partition was done in the 1920’s. 3) Any number of points during the past 800 years when either Britain’s colonial rule in Ireland tightened, or when Ireland’s resistance to said rule increased, or when higher number of Irish simply moved to England. Even going by the 1970’s for the “start date” I’m amazed it took that long!!!!! Quagmire Fatigue is the ultimate moral low road of such things.. It’s not so much about a critical mass deciding something was wrong, as a critical mass deciding that they really want to wash their hands of it. I’ve just befriended a Liverpudlian with Irish origins. It’s amazing how different North and South England are. I take it Arlene won’t be welcome in England when she leaves. When the bombs were going off in London back in the day, that poll would’ve been higher. Just saying. The 36% of colonisers is something similar to the dup share of the vote here. Maybe there should be a border poll in England then we would see what the d in dup really means. This has been the case for many a long year. Ironically, UK voters are irrelevant to the ‘precious’ union so it matters not a jot how they regard Northern Ireland. The maintenance of the colony costs milliards, courtesy of the tax payer. They’re going to take pretty good economical a hit real soon, let’s see if they need the money for themselves. Our re-unification may boil down to a cost-cutting decision. Brexit has brought a lot out in to the open. The big surprise for me is how much the English really hate each other. I mean there has always been class distinctions been rich and poor. But it seems the worst thing a English man can call another English man is a Elitest. And the real venom they seem to have one another is really shocking. None of them seem willing to listen to the other persons point of view if it is even slightly different from their own. One theory I’ve seen says that Brexit may create some seeds of hope is this. One thing that underpinned a lot of what’s dysfunctional about Britain and some of the worst cruelties of The Empire go back to their crazy education system. And there is some talk about changing it in particular there about looking to Finland’s experience of evolving from a very class based and middling at best system to a top level and remarkably egalitarian one-largely pushed by fear of the USSR and fairly recent independence. Americans look to Finland schools but for different reasons. Indeed England has never really had a strong push to strengthen schools for the sake of the nation-it’s always been about sectarian and/or class issues. Since the Victorian era British politics were pretty much “class struggles uber alles”. While are definitely some positives to that situation it’s not necessarily a very good set-up for changing education. Especially when the working classes learn very young to resent education along with “their betters”. It tends to make education reform an overdetermined endgame. Brexit is likely going to realign British politics now that the farmer who was selling to France, a factory worker whose plant didn’t survive Brexit, the banker whose connections were to Germany not the far flung places The Brexiteers want to set up shop, and the professor who teaches English writing to Spanish and Italian students coming to England to study share a common enemy: The Brexiteers. Of course this coalition is probably going to involve a lot of them holding their noses, especially at first. But it just might be the kind of political force that can push profound educational reform-For England!!! And that’s always a more powerful force than stalemate probe class politics if a country want a new education system. Such things do tend to change countries dramatically. Not in a day or a few years, but it would happen. It’s a bit much when people with double barrelled names accuse others of being the elite. The problem with the English they don’t want to pay for the upkeep of Northern Ireland. However, on the other hand they cannot stand the shame of losing their nearest colony and are therefore prepared to pay to keep it. Scotland on the other hand is doubly worth keeping not least because of its abundance of resources that Mother England needs to keep its finances going. Now, just think of a United Ireland with an Independent Scotland as part of the EU. And England by pass, and let the rUK get on with it. Best solution there could be. If only!!!!. This is the DUP’s deepest fear: that even though they want to be more British than the British, the British regard their participation in the UK as at best ‘meh’. At some point British Unionists are going to cut their losses. It would be interesting to crunch these numbers further – ie distinguish between Scotland and England & Wales. In my experience as an irish desceded Londoner, most English people couldn’t give a wotsit about the Orangemen. However, as anyone who has ever attended a Rangers – Celtic game (as I did many moons ago) can tell you the Scots might have a different attitude.